FXG_Info – the most important data in one place. 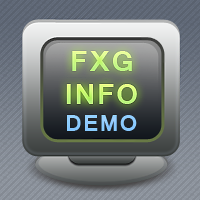 MetaTrader 5 Indicator FXG_Info provides basic statistical information about a particular currency pair. So that in combination with a chart representing currency price it is easy to determine whether the current situation is good for trading. And when you open a position it will clearly show you the current data such as SL, TP, RR. You are not limited to currency. You can use any market which is provided by you broker. Spread – current and maximum within the current candlestick. ADR (average daily range) – average value of daily volatility of a pair for the last week. Volatility is calculated as the difference between High and Low prices of the day. After the slash the percentage variation for the current day is displayed. So we know what volatility we can expect on the current day and what percentage of its price has already been accomplished. Pip*0.1 lot – pip value of account deposit currency for the size of 0.1 lot of position. In the parameters you can set size of position (not less than 0.01 lot). SL – if there is an open position, it shows the SL value (Stop Loss) in the deposit currency of the account (unless you disable it in the parameters) and in pips, including commissions for ECN brokers. 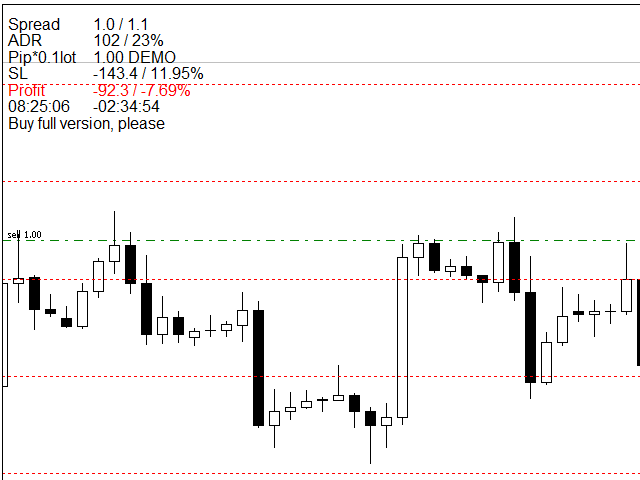 This is to verify that our position is consistent with our own trading plan. TP – if there is an open position, it show the TP value (Take Profit) in the deposit currency of the account (unless you disable it in the parameters) and in pips, including commissions for ECN brokers. If SL is negative, it also shows the RR (Risk Ratio) – the ratio of TP to SL that is necessary for verifying that our transaction is consistent with our own trading plan. Profit – if there is an open position, it shows the current value of profit of the position in the deposit currency of the account (unless you disable it in the parameters) and in pips, including commissions for ECN brokers.